Jayne Colino, Director, Newton Senior Center and past president, MCOA, presents MCOA’s Innovator of the Year Award to Ruthann Dobek and Frank Caro, co-chairs of Brookline Community Aging Network. I am proud and honored to be presenting the 2015 Innovator of the year Award to the Brookline COA and Brookline Community Aging Network (BCAN). 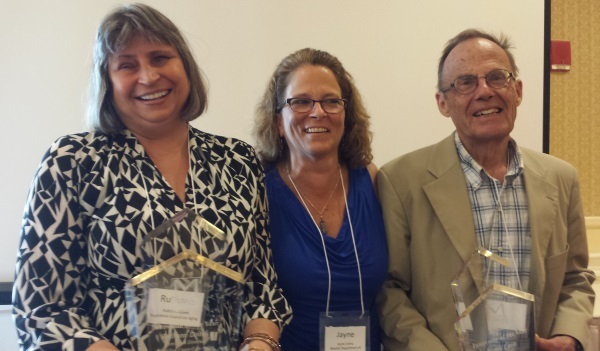 The accomplishments and the approach taken by Ruthann Dobek and Frank Caro as the leaders of Brookline COA and Co-Chairs of BCAN inspires me, and after hearing why they are receiving this award will hopefully inspire you too!! We all here today have heard over and over again from funding sources and others about the value of and need to work through collaborations and partnerships. All of us, as COAs, know this and are to varying degrees working through collaborations and creating partnerships. Brookline and BCAN have brought it a whole other level. Brookline Community Aging Network (BrooklineCAN) is a member-driven, volunteer organization primarily for older Brookline residents that promotes services and activities to enable independent living and improved quality of life. Its principal purpose is to ensure that older Brookline residents remain a vital part of the town's social, cultural, and civic life. BrooklineCAN works with town departments, businesses, and other organizations to make the town a better place to live for all Brookline residents. In talking with Frank about this award he shared his recognition that COA’s are primarily service providers, without a lot of resources, and advocates. The lack of resources requires us to focus on the service provision, which makes it harder to focus on the entire community environment as a whole. He also recognizes that as staff and appointed Board members may we have constraints placed on our advocacy roles. Citizen committees like BCAN allows for the latitude needed to advocate in such ways. In talking about the evolution of BCAN Frank shared that he first heard the concepts of livability and age friendly approaches a community could take at a GSA conference. Also a local service provider had received a grant to implement “at home” services within a certain area of Brookline. Which happened to be where Frank lives. Because of Frank’s involvement in and awareness of the COA and what already existed he encouraged the agency that had received the grant to work collaboratively with those service providers and not to duplicate what already existed. That’s how it started, now for what this collaborative approach has accomplished. BCAN presented WHOs Age Friendly process to the community as a vehicle to support BCAN’s mission to make the town a better place for all to live. Frank and Ruthann used The WHO process to call attention to the good features of the community that already existed throughout the community. They also used it to “nudge” town departments on issues and areas that could make things even better. This non-adversarial approach gave everyone involved a role in the partnership that has accomplished amazing things they can all be proud of. Not the least of which is being the first community in New England to be awarded the WHO’s designation as an Age-Friendly community. One great example, was the town’s establishment of the Slippery Sidewalk task force after BCAN brought attention to the fact that many of Brookline’s businesses were not complying with the sidewalk snow removal ordinance. BCAN filed a warrant asking the town to fulfill their enforcement responsibility. Needless to say the safety of the sidewalks has improved for all! They recently successfully advocated for the Tax Work off program to be expanded to renters when data showed that 2/3 of renters in Brookline were spending more than 50% of their income on rent. BCAN created listing of all public bathrooms in the town which is very appreciated not only by seniors but they got great appreciation from parents with strollers and with kids who are toilet training . Most recently, BCAN wrote for and received a grant to develop a mobility management program that Newton is collaborating on and if successful, will be replicable. They are currently advocating for an exemption to the town wide two hour limit on street parking to accommodate those attending the center for longer than two hours. I think they will succeed. Overall, BCAN’s efforts have raised awareness about and engaged more people in the opportunities to age healthy in Brookline ( some of who may not have seen themselves involved in the senior center), has raised awareness about the challenges to just that, and engaged more members of the community in advocating for the solutions to those challenges. BCAN is now invited to give input into deliberations around decisions effecting the community, and are sometimes cited without even being asked because they have made their role , their mission and vision clear. To quote Ruthann, “working creatively together strengthens the whole network, let you get to know each other better with contributes to working more effectively together. And the best thing about BCAN is that she is able and asked to share their successes with other communities and by doing that helps it what they have accomplished become a reality for other communities.